I have very, very vivid memories of when Even Worse came out in 1988. Weird Al was everywhere as "Fat," his send up of Michael Jackson's "Bad," was a monster hit. People may have slept on Polka Party, but Al was back in a big way with Even Worse. 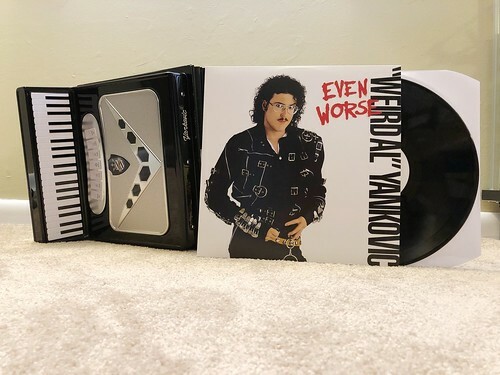 It was the one time I can remember where some other kids in school were paying attention to a Weird Al and a few people other than me even owned one of his records. It was a short lived phenomenon in my world, but I still have pleasant memories of that brief period of time in the fifth grade. The entire record is great. The Weird Al originals are top notch with "Stuck In A Closet With Vanna White," "Melanie" and "Good Old Days." The parodies are also strong as this was one of the last few Weird Al records where I either knew or liked the songs that were being taken on. "(This Song's Just) Six Words Long" is a fantastic version of George Harrison's "Got My Mind Set On You." I've always loved "I Think I'm A Clone Now," though these days I wish it was a parody of the Snuff version of "I Think We're Alone Now" rather than Tiffany's. It was also a thrill to hear prevalent use of the accordion on the "La Bamba" parody "Lasagna." This is one of only two Weird Al records that doesn't have a polka medley. I think the inclusion of one would have made this an even strong record, but even with that omission it's still one of his best.